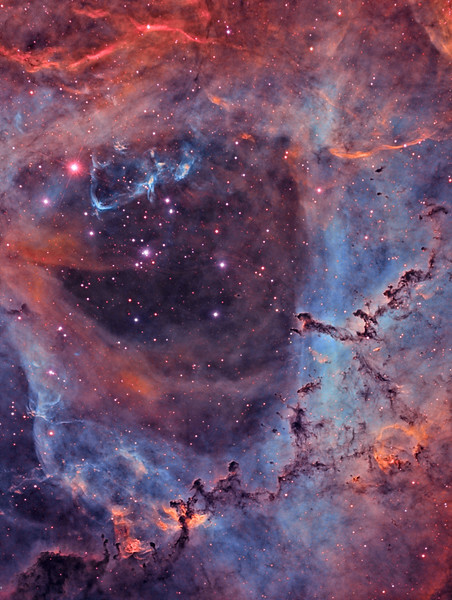 Visible here is a small portion of the large Rosette Nebula (NGC 2237), centered on its central cluster of stars; NGC 2244. This large round nebula lies some 5000 light years away and can be found in the constellation Monoceros near Orion. In optical wide field images the entire nebula appears strikingly similar to the petals of a red rose, hence the name. The image is constructed from exposures in three very narrow (3nm) wavelength bands corresponding to the emission profiles of ionised Hydrogen, Oxygen and Sulphur to form the resulting detailed and brightly coloured scene. Several striking shapes can be seen here, many of which resemble animals of various kinds. In particular the figure of a leaping Cheetah is very obvious near the centre. These dark shapes are denser clouds of dust and gas, slowly being eroded away by the intense ultraviolet radiation from the young stars in the central cluster. These stars have themselves condensed out of the nebula relatively recently. The brightest cluster members, HD 46223 and HD 46150, are massive O-type stars with stellar winds and radiation powerful enough to have cleared the nebula's central cavity around the cluster.